Bring your medical practice Into the present. Even if your medical practice is new to the idea of speech-recognition technology and you’ve been going about creating patient documentation the same way for years, Dragon® Medical One can quickly and painlessly bring your practice into the present and allow you to document within your EHR with ease. 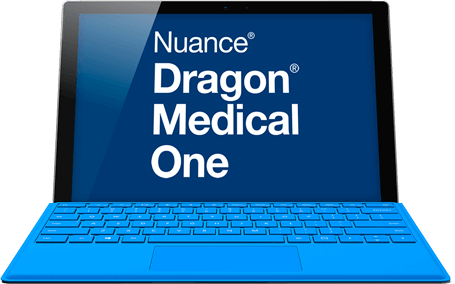 Dragon® Medical One gives clinicians and their support staff the power to instantaneously create secure digital documentation from anywhere and send it directly to any Windows-based device. It even gives users the ability to work within applications such as Microsoft™ Word and Windows Outlook, further streamlining workflow. Using a cloud-based speech recognition solution means you can access patient documentation from anywhere and make notes, create treatment plans, update histories and keep track of billing information from the office. Take your dictation to the cloud today. Just one of the great features of Dragon® Medical One is the reduced costs that come from cloud-based subscription technology. *Thin clients may require additional implementation and costs. A SPEECH RECOGNITION SOLUTION UNLIKE ANY OTHER. Installation Is a Breeze with Cloud-based Solution. Fast, extremely responsive, and highly accurate out-of-the-box (without the box), Dragon® Medical One provides clinical speech recognition and speech profiles that can be easily accessed across multiple devices. THE NEXT LEVEL OF SPEECH RECOGNITION IS HERE. Dragon® Medical One is designed for speed, accuracy and flexibility. It features speech profiles that can be accessed and shared across the widest range of devices in the industry. You don’t need a huge budget to get huge benefits. Our cloud-based solution offers affordable subscription-based pricing so there’s little up-front capital investment. Cloud-based clinical speech recognition for dictating at the cursor in leading EHRs—lightweight versatility, heavyweight performance. Gives clinicians the freedom to complete clinical documentation using an Android or IOS smartphone as a wireless microphone. Clinicians can complete their patient notes at any available workstation, with or without a hard-wired microphone, as soon as they meet with each patient. PowerMic Mobile is a smartphone compatible app available via the App Store and Google Play Store to simplify the documentation process.